WSDOT wants drivers who use northbound SR 167 to prepare for a new configuration near the 405 starting as soon as Thursday morning, Feb. 1. Starting tonight – Wed., Jan. 31, 2018 – construction crews working for the Washington State Department of Transportation plan to complete striping work to move the northbound SR 167 lanes of traffic farther to the right side of the roadway. The same number of lanes will remain in place after the shift is complete. This traffic change is necessary to provide crews enough space to create a new construction work zone. They will use this area to continue building the future flyover ramp for the I-405/SR 167 Interchange Direct Connector Project. This work is weather dependent and subject to change. If this work is not completed tonight, crews will postpone their work to the next dry night. Wednesday, Jan. 31, to the morning of Thursday, Feb. 1 – Up to two lanes on northbound SR 167 between South 180th Street and I-405 will be closed from 10 p.m. to 7 a.m.
Wednesday, Jan. 31, to the morning of Thursday, Feb. 1 – The northbound I-405 ramp to northbound SR 167 will be closed from 11 p.m. to 6 a.m. A signed detour will be in place. 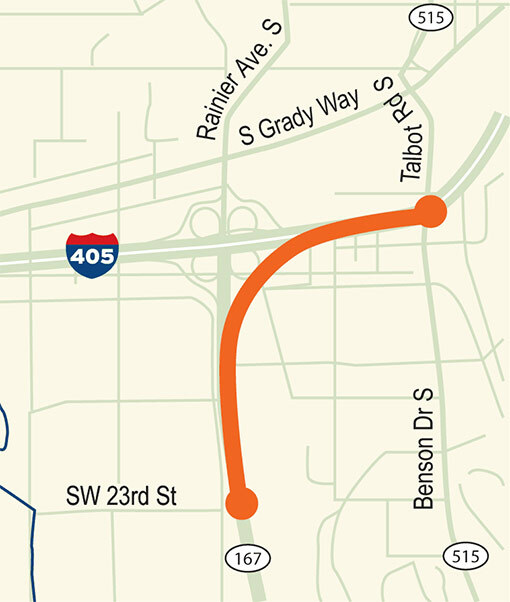 Wednesday, Jan. 31, to the morning of Thursday, Feb. 1 – The northbound SR 167 ramp to northbound I-405 will be closed from 11 p.m. to 6 a.m. A signed detour will be in place.